XI'AN: A new discovery has created a great stir in Chinese archaeological circles, raising questions that will require further excavations before any kind of definitive answer might be given. After two months of sleuthing, a group of Chinese archaeologists have found what they believe to be a large group of tombs of China's Western Zhou Dynasty (1046-771 BC) in Qishan County, in Northwest China's Shaanxi Province. But are these actually tombs of the kings of the Western Zhou Dynasty? Finding the answer to this question is a great challenge and attraction for Chinese archaeologists and historians. Existing at a time when the power and splendour of China's slave society was at its height, the Western Zhou Dynasty had a series of more than 10 kings, but their tombs have, so far, never been found. And historical records and documents offer only a paucity of information on the history of the Western Zhou Dynasty, which lasted some 300 years, while a similar paucity of unearthed relics, ruins and tombs further augments the mystery. Over the past decades, Chinese archaeologists have been trying hard to find ancient tombs and building ruins of the Western Zhou Dynasty's kings and lords, but there has been little in the way of revealing discoveries. In December 2003, while conducting archaeological investigations near the Zhougong (a king of the Western Zhou Dynasty) Temple in Qishan County, teachers and students of the Archaeology and Culture College of Peking University found two pieces of tortoise shell with Chinese characters inscribed on them believed to be from the Western Zhou, and these shells drew attention to the ruins of this cemetery, said Wang Zhankui, head of the archaeological team conducting excavations at the site. 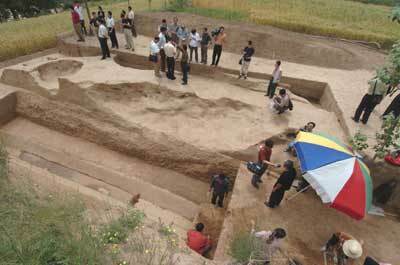 According to Wang, who is also deputy director of the Shaanxi Provincial Archaeology Research Institute, the excavation team for the cemetery, comprised of archaeologists from his institute and Peking University, was established in February 2004, with the approval of State and Shaanxi archaeology authorities. "Over the past two months, we have carried out large-scale investigations and excavations of the ruins of the cemetery and have made some progress," Wang said. At present, the team has learned that the ruins cover an area of about 10 square kilometres with a number of ancient ruins and relics including ashes pits, building foundations and pottery shards. "From the unearthed relics and ruins, we have deduced that the ruins are of large scale and rich in cultural relics from the periods of the Yangshao Culture (6,000 years ago), Longshan Culture (4,000 years ago) and pre-Zhou to Western Zhou (3,100 to 2,770 years ago). And the relics from the Western Zhou Dynasty are generally the more important and more significant ones," Wang said. The discovered tortoise shells inscribed with pictographs dating to the Western Zhou Dynasty, a large-scale group of tombs with four tunnels and the rammed earth walls around the tombs indicate that the site must have been a high-ranking cemetery for royal families in Western Zhou Dynasty, Wang said. "However, we cannot be sure that they are the tombs of Western Zhou kings, We only know that they are the highest ranking tombs of Western Zhou Dynasty to be discovered so far. 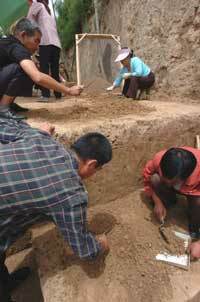 Further excavation is needed to ascertain whose tombs they were," Wang said. As of Wednesday, the team had surveyed some 80,000 square metres of the ancient site and found 12 ancient tombs, of which seven were built with four tunnels. Also, seven pits with chariots and horses have been unearthed in the cemetery. "Ancient documents mention tombs with four tunnels in the Western Zhou Dynasty but no such tombs have ever been found before, and these tombs make us believe that there were, indeed, tombs with four tunnels in the Western Zhou Dynasty. 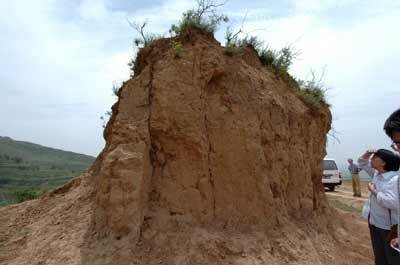 This is an important discovery," said Lei Xingshan, an associate professor from Peking University, who is a member of the excavation team. Among the seven large tombs with four tunnels, the one numbered M1 is the largest: the north tunnel is 30.29 metres long; the south, 29.3 metres; the west, 19.45 metres; and the east, 22.91 metres. It is far larger than any other known Western Zhou tomb, Wang said. It is much to be regretted that archaeologists found a number of holes indicating that the cemetery has been looted. In M1 tomb alone, there are six such holes, one of which is 17 metres deep. Experts say the latest looting took place less than a year ago. Although the tombs have been robbed, archaeologists still hope that rare cultural relics can be found inside and around the tombs. "If we can find well-preserved pieces of bronze ware, parts of chariots and their harnesses, ritual objects and sacrificial utensils with long inscriptions, it will be great for academic research," Wang said. "So, we plan to open the tombs after careful investigation and a large-scale survey of the entire cemetery, but the plan must be approved by the State Administration of Cultural Heritage," the team head said. The archaeological team also unearthed three groups of ancient building ruins with a floor area of some 500 square metres in the cemetery, and around the building ruins there are a number of ancient hollow bricks, long narrow bricks and flat tiles. "The hollow bricks, which were considered high-class building materials, are rarely mentioned, even in the records of Zhouyuan and Fenghao, two capital cities of the Western Zhou. This shows that the buildings in the cemetery were for people of high rank," Wang said. Chinese archaeologists carried out recovery excavations in the places where pieces of oracle bones and tortoise shell were unearthed, and after a 67-day operation had netted some 700 pieces of tortoise shell, 80 of which were inscribed with characters, Wang said. "Because the pit which contains the oracle bones and tortoise shells was found by a local farmer named Shi Haoshan, it was named Haoshan Pit to acknowledge the farmer's part in the discovery," Wang said. From the characters on the unearthed tortoise shells, experts learned about wars, sacrifices and even records of the dynasty, all important materials for academic research on the Western Zhou. What has so excited the Chinese researchers is the great importance of the Western Zhou Dynasty in Chinese history. The most important period in the age of slave society, the Western Zhou laid the foundation of ancient China's political, legal and military systems. And it brought advances in agriculture, with the improvement of farm implements and the development of farming techniques. It also witnessed development in craft industries, especially in the manufacture of bronze wares, pottery and textiles, according to historical records. The common belief among archaeological and historical circles is that Zhouyuan, one of the two capitals of the Western Zhou Dynasty, was located between present-day Fufeng and Qishan counties in central Shaanxi, covering an area of about 20 square kilometres, and was the birthplace of the Zhou people. 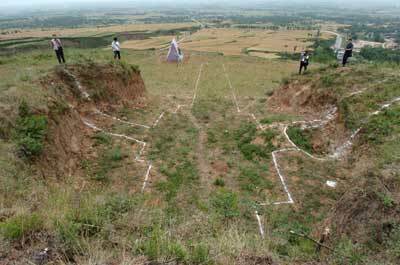 The new discovery of this Western Zhou cemetery in Qishan County has narrowed down the searching sphere, because royal tombs were usually built near capital cities in ancient times. "If Zhouyuan was really located next to the newly discovered cemetery of Western Zhou Dynasty, it is highly likely that these tombs housed the kings of the Western Zhou Dynasty. Our further work should provide us with a definitive answer to this question," Wang said. "I vaguely remember a Chinese dignitary a few years back speaking to some , I believe, Western Euroweenies, as saying something like, " When your ancestors were still living in caves here, mine were building empires." This article seems to back him up........Any one else remember this?" I don't recall that event but I do recall Chou En Lai being counseled by Anwar Sadat to be patient with the economic growth in China because, after all, China was a young country, relatively speaking of course. I hope they can find some graves that have not been looted. It also can be hoped that the bronze ware and shell inscriptions give some indication of cultural contacts. This time period may have some indication of outside contact to the south as to metal working techniques. "I vaguely remember a Chinese dignitary a few years back speaking to some , I believe, Western Euroweenies, as saying something like, " When your ancestors were still living in caves here, mine were building empires." This article seems to back him up........Any one else remember this?........." Some believe the Zhou were a Caucasian people...at a minimum, they were a mixed race people. I don't remember the Chinese dignitary's comment. But the article discusses finds dated primarily to 1046-771 BC, with some side discussion of events back to 4000 BC. Europeans were not still living in caves during these periods. By 1046 major civilizations had already risen and fallen in Greece. Even by 4000 there were megalith-building cultures throughout Europe. I would have said... yeah means alot coming from a society where one of those empire builders Burned all know history texts, and then had new historys written with the emporer being responsible for everything. Thanks for the ping, farmfriend.